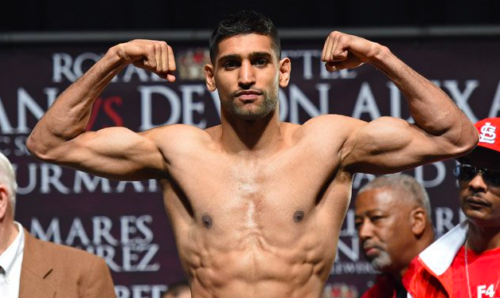 Amir Khan (31-4, 19 KOs) has set his eyes upon fighting Adrien Broner (33-3, 24 KOs) in his comeback bout, which is expected to be held in March. Khan, who has been away from the ring since his KO defeat to Saul ‘Canelo’ Alvarez in May 2016, took to social media to call Broner out. “Adrien Broner, let’s go champ,” he wrote along with a laughing emoticon. Broner, who was outclassed by the unbeaten Mikey Garcia in his last fight in July last year, has also been in talks to trade punches with the unbeaten Omar Figueroa Jr. However, the former four-time world champion has said that he doesn’t want to fight until he’s “100 per cent” ready, as, he claims, was not the case against both Garcia as well as Shawn Porter (to whom he lost in June 2015). “I will be at 100 per cent for this next fight no matter if it’s against Omar Figueroa Jr. or Amir Khan or anybody else who wants to fight me,” Broner was quoted as saying by boxingnews24.com. Khan, meanwhile, had announced last week that he will be making some “big announcements in next 10 days” – about three days from now.